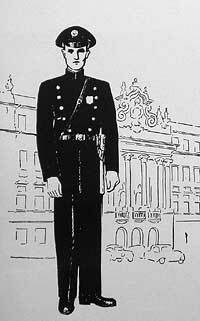 It used to be that the only uniform the Civil Guard of Sao Paulo wore was a jacket, pants and cap of navy blue wool. 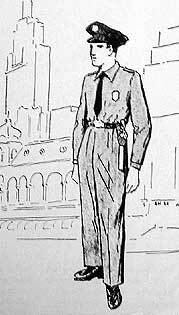 Later, a summer uniform of grayish linen was introduced, generally following the same pattern of the former with the exception of the white helmet worn while directing traffic. Still later, a new uniform was adopted for daily use which reduced the uniform to mere pants and shirt by eliminating the jacket. Thus, the three sketches on this page illustrate the history of one Brazilian institution over several years. In this newspaper column, we always seek to look beyond the evident transformation of the forms and colors. We look for the more subtle transformations in mentalities, attitudes and values that are symbolized and expressed in forms and colors. Thus, analyzing the three uniforms shown here in this light, we reach the following conclusion. According to the doctrine of the divine origin of power, those who legitimately exercise functions of authority do so in the name of God. The legitimate holder of authority, whatever his title or position, does so because of a power that comes to him from on high. This power transcends man himself and dignifies those who command and those who obey. However, this transcendence should be expressed in a perceptible form. Therefore, the symbols of power should be appropriate to inspire respect. And when the position employs the use of a uniform, it should have the distinction corresponding to the function of whoever is wearing it. This concept obviously applies, par excellence, to the supreme magistrates. However, it also applies to a lesser degree to offices that participate in public authority even though in a very secondary way. This view of authority is contrary to the exquisitely revolutionary doctrine of popular sovereignty. This holds that since the power comes from below, it does not confer any superiority upon the person holding the office. Thus, those who exercise power should use symbols and, if it be the case, uniforms that manifest their absolute equality with those below them. Because of its seriousness, distinction, and sobriety, the first uniform of the Civil Guard of Sao Paulo, obeys the first principle cited above. The second uniform already reflects an obvious concern towards attenuating the marks of superiority of the first. And, finally, the third uniform goes yet farther than the second in increasing this tendency. Thus, we see a small manifestation of the large gust of pagan and egalitarian naturalism that, in these cataclysmic days, is sweeping the universe. This entry was posted in Plinio Corrêa de Oliveira and tagged applies, because, Brazilian, Civil Guard, egalitarianism, God, however, mentalities, policeman, popular sovereignty, Professor Plinio Correa de Oliveira, Reign of Mary, Sao Paulo, seriousness, symbolize by Plinio Corrêa de Oliveira. Bookmark the permalink.